The perfect evening for whale watching when the air is crisp and cool off the Northern tip of Vancouver Island, BC, Canada. There are few greater experiences than whale watching from a small boat off Northern Vancouver Island. It is even better luck to have a clear evening as the sun sets over the Island, and a whale methodically swims by. The waters off the northern tip of Vancouver Island are downtown "orca whale city" especially between the months of June and October. The Northern Resident Killer Whales spend the majority of their time travelling, foraging, feeding, and socialising in the waters stretching from Campbell River in the South to Port Hardy in the North. Photo of a bright sunset over Northern Vancouver Island during a whale watching excursion. There are commerical whale watching tour operators from many of the Northern Vancouver Island communities, however to see a whale in the beautiful sunset light is just magic and is possible from only a very few operators particularly those that stay out overnight. 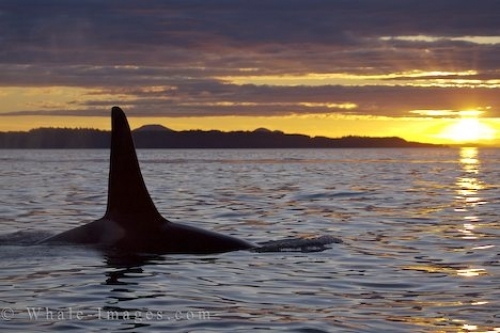 Killer Whales during sunset off Northern Vancouver Island, British Columbia, Canada. Check out more information about Whale Watching on Northern Vancouver Island in British Columbia, BC, Canada.